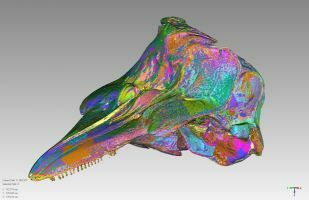 For over 12 months now, the Geomagic team has been advising and watching as the team at Idaho State University's Virtualization Lab went full bore into creating 3D data out of natural history subjects: whale skeletons, dolphin skeletons, fossils and more. As the team, headed by Dr. Herbert Maschner, built up its 3D inventory, so they have been making the model data available for schools worldwide at ivl.imnh.isu.edu. The scan data is put into Geomagic Studio to be processed into usable 3D models; the software automates the process of filling remaining holes, removing intersecting polygons, and clearing vertex color data. Saving out the data to 3D PDF both as high and low-resolution models, the files are then accessed by schools worldwide. Click here to see this story in a longer, more detailed version in Computer Graphics World.